It seems to happen every year in the west that opening week of archery season is blazing hot. Considering that blacktail are the hardest deer to hunt, sometimes I wonder if I should forget it and head to the coast and do some fishing instead. But I know if I do that I’ll get a call from one of my buddies saying “Man, you should have been there!” So, year after year, I head up to my spot. One thing I have learned is that if I’ve been paying attention during my pre-season scouting, I know that deer are out there. It’s just going to be a little more difficult, that’s all. There are a few things to think about in the heat. I am not as hungry and I tend to get sleepy. Well, deer are no exception. They are going to be spending a lot of time in the shade, lounging. So the question arises about whether to wait until that 10 minute opportunity strikes (the first or last 10 minutes of daylight), or do I get a bit more aggressive and see what I can shake from the brush. There are several theories of course and it depends on a few factors. Still hunting will probably always be my preferred method of hunting blacktail. I love the slow, quiet stalk up to my blind at 4:30am and I love to watch the woods come alive as it gets light. I like the idea of already being in my spot and to not make deer nervous by crunching through the woods at noon. I like that. But it takes a lot of patience, especially when it’s hot. It’s a tough call if you plan on hunting the same area for the next couple of months. If you are too active, you may drive the deer out of your area altogether. If you keep it cool, the pressure of the hunt around your area may drive deer in. Since I hunt one basic area during archery and the general season, I like to keep my presence to a minimum. It’s a fine line during the early season. A couple of things I like to remember in the heat is that deer are more likely to be eating in the late afternoon. They will also get water. Try to set up on the edge of a clearcut, paying close attention to the wind, and wait till they come out to eat. Make sure there are fresh tracks or fresh sign where you set up. You want to know that it’s a recently traveled area. If you choose to set up over water, it’s the same deal. Many times you will see a couple of does come out to drink. Be ready because the bigger bucks will wait till the last bit of light is almost gone before they come out. They will though and if you’ve done your homework, you have a chance for a shot. The other thing that I find during the day is that if I choose to walk around, I can almost always jump a bedded buck, usually when I’m not ready. When I jump one, I try to remain calm and walk in another direction. 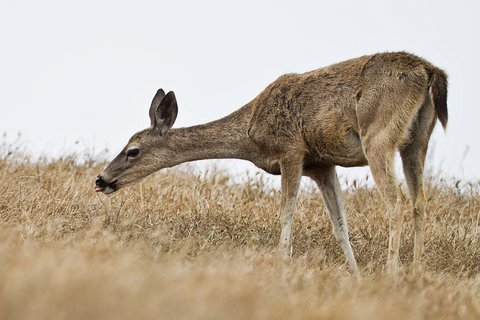 Deer are smart and can tell if you’re aggressive. If you play it cool, he is apt to not run too far and settle down somewhere close. Try to remember where he went and stay away for awhile. You may get a chance to put the sneak on him later in the day. Some guys recommend a drive during the heat to get the deer moving. I think it’s good if you’re not coming back to that spot for awhile. Another thing you can do is to take a buddy (one preferably) and go a mile or two from your prime spot. Find a thick area, usually a north facing slope, and have one guy wait at the bottom and the other should come down the slope through the brush. This often provides a quick shot so it’s important to first see where deer are likely to exit, pay attention to the wind and get your ducks in a row beforehand. Blacktail are exceptionally smart and they will test you fully. The heat is a bear but you can still have a good hunt as long as you try to be as stealth as possible in your tactics. Give them time to recover and move to different locations quietly and slowly. If you’re calm, chances are they are too.